Upon landing in the early morning and subsequently relocating using the built-in swing arm, all instruments collected detailed data on the composition and nature of the asteroid. 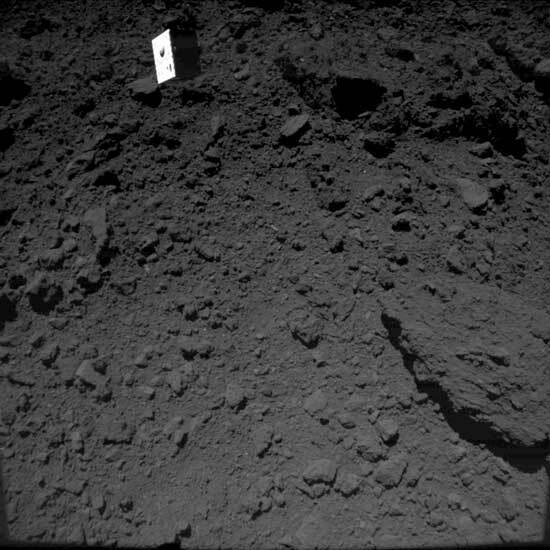 The on-board camera provided pictures of the landing, hopping manoeuvres and various locations on the surface. With MASCOT, DLR has been working closely with the Japanese space agency JAXA and the French space agency CNES. MASCOT landed safely on Ryugu in the early morning of 3 October 2018. “After a first automated reorientation hop, it ended up in an unfavourable position. With another manually commanded hopping manoeuvre, we were able to place MASCOT in another favourable position thanks to the very precisely controlled swing arm,” says MASCOT operations manager Christian Krause from DLR. During the first manoeuvres, MASCOT moved several metres to the next measuring point. Finally, and seeing that the lander still had battery power left, the researchers dared to make a bigger jump. All in all, MASCOT explored Ryugu for three asteroid days and two asteroid nights. A day-night cycle on Ryugu lasts about 7 hours and 36 minutes. At 21:04 CEST, communications with Hayabusa2 were interrupted, because of the radio shadow entering with each asteroid rotation. Hayabusa2 is now returning to its home position, at an altitude of 20 kilometres above the asteroid’s surface. Great job from Japan ..